In the previous pAsuram, AzhwAr established that only emperumAn is the apt entity to be attained. Having established this, he enjoys that emperumAn, who is the ordained lord, in this pAsuram. pAviyEn mellAvi mey migavE pUrikkum avvavai ellAm pirAn uruvE enRu – my soft mind and my body will puff up with pride, thinking that all these flowers are [indicative of] emperumAn’s divine form only. 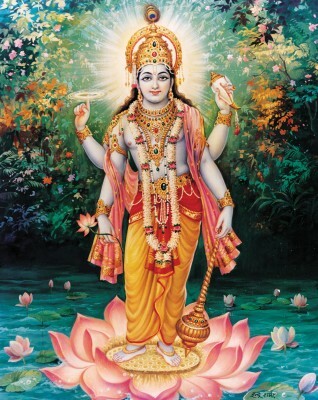 The word pAviyEn would refer to AzhwAr thinking that he has lot of sins in him due to which he is unable to see directly the divine form of emperumAn. Alternatively in an ironical way, the word pAviyEn could mean one who is fortunate. The pAsuram would then mean that AzhwAr feels that he is fortunate that looking at the dark coloured flowers which are similes for emperumAn, his mind and body would puff up due to pride [as if they had seen emperumAn himself]. The word Avi refers to mind. Since the pAsuram says enRum kANdORum mellAvi pUrikkum it shows that his mind will lose consciousness out of being puffed up to a very high extent and that once consciousness is regained, it will again puff up and lose consciousness, thus repeating this process, indicating the softness of his mind. AzhwAr is amazed that not only his mind, which is the gateway for knowledge, gets puffed up but his body, which is without any knowledge, also puffs up. We will take up the 74th pAsuram next. This entry was posted in iyaRpA, periya thiruvandhAdhi on January 24, 2019 by T N Krishnan.